Shirley Ray: My family moved to Central Oregon to the farming area between Bend and Redmond when I was about 6 months old. In 1933, my father died of typhoid fever, which was fairly common at that time. [After my father’s death] my mother and brothers and I moved back to Junction City…. The summer I was 10, I came back to Bend to spend a few weeks with [my aunt, Maren Gribskov, who started Pine Tavern]. I stayed with her every summer until I graduated from college, then came back as a permanent resident in 1949…. 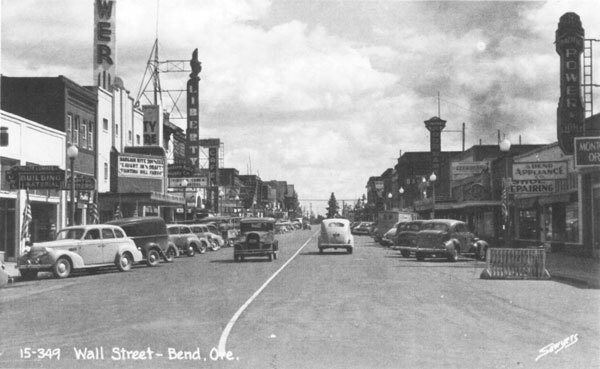 When I came to Bend, which was an absolutely wonderful place to grow up in the summer, I worked my way up from menial jobs to bus girl to waitress to hostess. SR: Third Street was fairly close to the eastern limits… A lot of the neighborhood streets weren’t paved, but downtown was. There were no [traffic] lights…. Bicycles were the main transportation. SR: We had a huge influx of service people and wives…. Downtown and all of the restaurants were very busy. Pine Tavern was very busy. SR: Women worked in some of the mills, box plants and things like that. I don’t know if they did in the real mills. It was against the culture at that time for women to work out of the home. Those that had to, restaurant owner was one of the few jobs they could do. Restaurant, telephone company, some store clerk positions. SW: Was there a festival at the time that was a “big deal” in town? SR: We had the Water Pageant. It started in the ’30s and it was mostly a Fourth of July festivity and they would float, different organizations would build floats and float down Mirror Pond, starting at the footbridge and ending just about here [at the Looney Bean]. We were unique in that. It did very very well. It brought visitors to Bend from way out. SR: Sometime during the war they had a community concert organization that performers would come to town and perform at the high school. Marian Anderson [a celebrated singer and the first African American invited to perform at the White House] came out one time and we had a waitress that was the wife of a serviceman that came from the deep south, and when she heard that Marian Anderson would be eating at the Pine Tavern, she was terribly upset and my aunt said, “You don’t have to work today.” But Miss Anderson ate at the Pine Tavern.